An elementary mistake on the grandest playground cost the Cavaliers Game 1 of the NBA Finals—and maybe more. J.R. Smith’s stunning blunder will live in postseason infamy, no matter how he explains it. OAKLAND, Calif. — True blunders, the type that stand the test of time, share three qualities: The guilty party makes a critical error in a routine situation, he’s the last one to realize what’s happened, and once the truth dawns on him it’s already too late. In sports, blunders invariably unfold in slow motion: the ball trickles between the infielder’s legs, the punter ambles out of the pocket when he should just fall to the ground, Chris Webber cradles the ball and makes the “T” sign with his hands as his balance wavers. 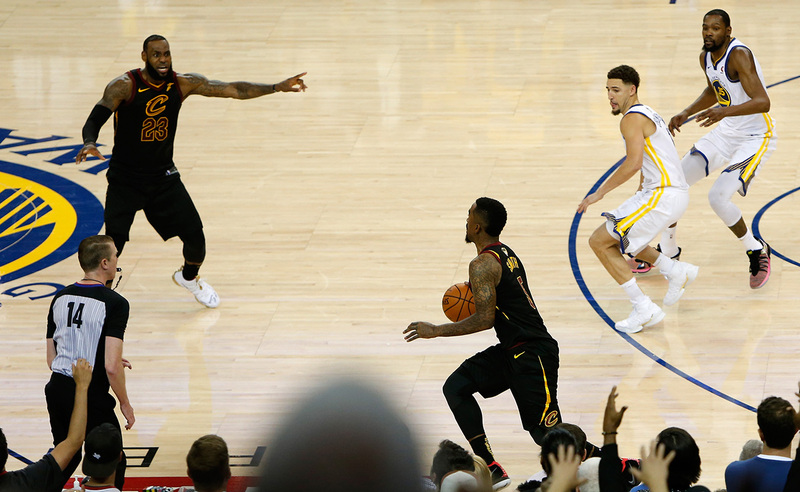 J. R. Smith found himself in such a time warp in Game 1 of the Finals, as he dribbled away from the basket during the final seconds of regulation. 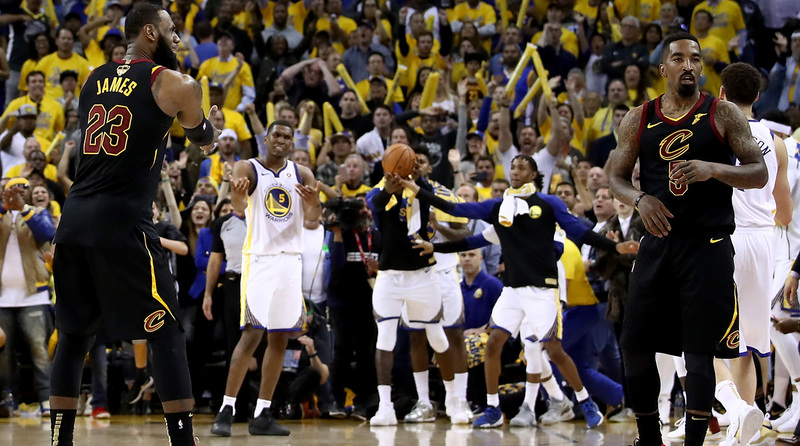 The Cavaliers guard had just made a crucial play, muscling Warriors forward Kevin Durant out of the way to claim an offensive rebound off teammate George Hill’s missed free throw. Smith had seized an unexpected second chance at a stunning upset. There were less than five seconds remaining and the score was tied at 107. Only good things could happen, and Smith had three obvious options. He could attempt a game-winner, by lofting a quick put-back or dribbling into a turnaround jumper. He could call for timeout and let coach Tyronn Lue draw up a play. Or he could pass out to LeBron James, who had already scored 49 points on Thursday and who had hit two game-winners earlier this postseason. But as Smith embarked on his fateful dribbles from the middle of the paint to outside the three-point arc at the right angle, the rest of Oracle Arena reached the only possible conclusion: He thinks the Cavaliers are winning and he’s trying to run out the clock. He has no idea. And it’s too late. James pointed towards the hoop, as if to say, “Wrong way.” Hill cut towards the corner and sought a bailout pass. Cleveland’s Tristan Thompson and Jeff Green stood dumb-founded on the weak side. In the confusion, Golden State’s players defended the passing lanes and took care not to foul. With the clock nearly out, Smith finally passed to Hill, who barely had enough time to toss up a heave that didn’t even hit the rim. The buzzer sounded. Somehow: Overtime. For the only party who mattered, the moment of recognition came too late. Smith, thoroughly confused, looked in every direction after the buzzer sounded. He then appeared to tell James: “I thought we were up.” An elementary-school mistake on the grandest playground. The blunder proved fatal, as the Warriors ripped off a 9-0 run in overtime to claim a crushing 124-114 victory. As it turned out, Smith’s error wasn’t the only regrettable late-game incident: The referees overturned a late-game offensive foul call on Durant after using video review to determine that James should have been whistled for a block. A dejected Lue said afterwards that James had been “robbed,” and he questioned the officials’ right to review the play given James’s positioning well outside the protected circle. Nevertheless, it was Smith’s total lack of awareness that will haunt Cleveland as this series progresses. What would have happened if Smith—one of the least shy shooters in league history whose very nickname is “Swish”—had simply gotten a shot up? What would have happened if he, or James, had called timeout? What kind of buzzer-beating magic would have unfolded if Smith had passed to James as soon as he collected the ball? How many ways could Cleveland have prevailed if Smith had simply known the time-and-score situation? Smith offered two different explanations for his blunder, neither of which will save him from basketball infamy. The first came with his spontaneous utterance to James on the court, which confirmed the consensus suspicion that he believed Hill’s first free throw, a make, had put Cleveland ahead. Kerr certainly thought Smith had misread the score. The former player turned coach said that the sequence reminded him of a similar sequence from the 1984 Western Conference semifinals, when Mavericks guard Derek Harper dribbled out the clock in a tie game against the Lakers. Smith’s second explanation came later in the locker room, when he told a media horde that he was expecting someone on the Cavaliers to call timeout. In this version of events, Smith insisted that he was reluctant to shoot out of deference to Durant’s length. He added that he would have held on to the ball and allowed himself to be fouled if he had thought his team was leading. His pass to Hill, Smith argued, was evidence that he knew the correct score all along. If anyone had sympathy for Smith, it was Durant. After all, the 2017 Finals MVP had been nudged out of rebounding position by a 6’6” guard. Before Smith let him off the hook, Durant was in line to shoulder the blame because he hadn’t used his height and length advantages to claim the defensive rebound and set up a possible game-winner. For James, this defeat cuts deeply. Throughout this postseason, the four-time MVP has delighted observers by unveiling his photographic memory and instant recall of game action. He took reporters frame-by-frame through his dramatic one-legged game-winner against the Raptors in the second round. He described an entire series of plays from a momentum-swinging Celtics run during the East finals. He listed off each of his five turnovers in painstaking detail after another loss to Boston. Following Game 1 of the Finals, James made a point to say twice that he knew exactly what had happened on the controversial block/charge call. “I read that play just as well as I've read any play in my career, maybe in my life,” he said. During Smith’s decisive mistake, though, James appeared as stunned as anyone. He was a second or two too slow in motioning for timeout, likely because he couldn’t believe what Smith was doing. James had no explanation for the inexplicable. The pain for James comes from being undone by such a basic miscue, but also in the extraordinary stakes. Game 1 was one of the most remarkable performances of his career; James finished with a postseason career-high 51 points, becoming the first player since Michael Jordan in 1993 to score 50 points in a Finals game. He watched as a strong team effort and standout performances from Kevin Love and Larry Nance Jr. were wasted. Facing disadvantages in talent, chemistry and team-wide experience, James saw an excellent opportunity to shift the pressure fully onto the Warriors go down the drain. To win this series as steep underdogs, the Cavaliers needed good luck, like Smith’s unlikely rebound. But then, within four misguided seconds, the good luck soured. Five minutes later, it was spoiled rotten. That sharp, harsh shift in fortune begged the question: Did James’s best shot at shocking the world and unseating the defending champions just elude him?